If you use the internet, you are at risk for identity theft, especially as a professional in today’s job market. Job seekers are being targeted more frequently than ever. Whether you’re very active in your job search, have your resume on your LinkedIn & other career websites, or just casually entertaining a recruiter from time to time over the phone - keeping your personal information on lock isn’t as easy as you would like to think. Scammers are creeping into inboxes and voicemails using smart and deceiving ways to appear legitimate. How? By preying on online resumes, job boards, and company pages to concoct the perfect position to lure you in. Why? Identity Theft. Scary, yes, but there are ways to help decipher if a recruiter is the real deal. Below are some ways you can better prepare yourself to recognize a scam when it appears in front of you. They are over aggressive in selling you. If the person you are speaking to isn’t asking you much about yourself, your background and your job search, that’s a red flag. Legitimate recruiters take the time to find out if you are a good fit for the company, it’s culture, and the position itself. Be on alert if someone is rushing to sell you on the job and demanding information. Acting as if you already have the job or offering you a position before you’ve even had a complete interview are also bad signs. It is very important to a recruiter to put quality candidates in front of hiring managers. If he or she is legit, they will take the necessary time to decide if you are a match. If someone urgently asks you to fill out a direct deposit form or applications with personal information to start the “hiring process ASAP”, stop and run! They are an “independent recruiter” with a small network. Do your research. LinkedIn is a good place to start. Reputable recruiters have a wide net of contacts in the staffing industry, along with all the industries in which they recruit for. Their network will not only be large, but it will be filled with credible connections. Scammers often steal information from other online profiles to create an impressive profile for themselves to use on job boards. Another tell-tale sign is if they have a free email address such as @gmail.com or @yahoo.com. Copy and paste their profile photo and text into Google to search and verify they aren’t using a stock image or the photo or resume of someone else. It is also a good idea to Google the recruiter’s name along with the word “SCAM” next to it to find any posted any complaints or issues. The job seems too good to be true. Yes, a remote position at a Fortune 500 company with way above average pay and short hours sounds amazing. If these positions do exist, they are very rare and very sought after. The chances someone is contacting you randomly about this type of job should make you skeptical. Use your common sense and research the recruiter and the name of the staffing firm. Never give a recruiter your money. There should never be a processing fee for a job submittal. The companies and employers who are hiring pay recruiting firms most, if not all of the cost associated with filling their open positions with quality candidates. You may be required, depending on the company, to pay for a background or drug test, but only after you have received a formal job offer and completed a full round of interviews. They ask you for your full social security number very early in the process. No one should be asking you for your driver’s license and full social security number, or a voided check during the interview process. In some cases they may need the last 4 - 5 digits of your social security number to submit you but not the full number. Never give a recruiter your full social security number before you have had an interview with a company. If needed it wouldn't be until late in the process. A good rule to stick to is, if you wouldn’t put it on your resume, you shouldn’t readily give out the information. Don’t forget to report fake recruiter profiles to LinkedIn and other job boards. If you’re not actively seeking a new position it may be a good idea to review your privacy settings on your LinkedIn account. Users have the option to make themselves less visible under ‘Privacy Settings’ where they can go to the ‘Communications’ tab to edit ‘Who can send you invitations’. Here you can also choose to not receive communication about career opportunities and new ventures. Also, never open attachments from recruiters until you are sure you are speaking to someone legitimate. E-Mail phishing scams is another major way a hacker can access your personal information. A job hunt can be frustrating at times and full of ups and downs. 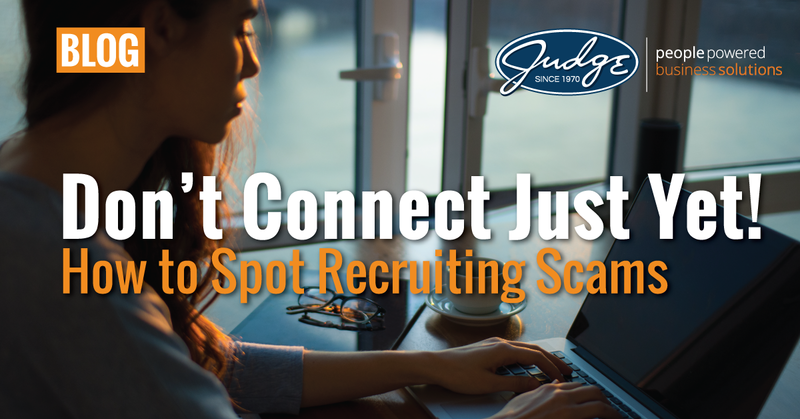 It is important to stay patient and alert to protect yourself from falling victim to fake recruiters and identity theft scams.